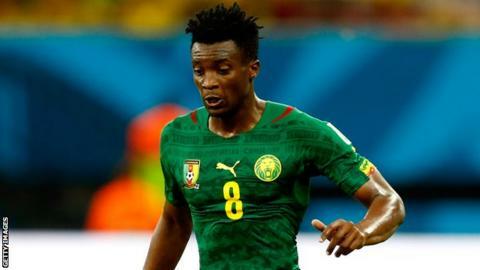 Cameroon forward Benjamin Moukandjo is aiming for success with Lorient after joining the French club on a two-year deal from rivals Reims. The 26-year-old, who has been in French football since 2007, joins alongside Ghana striker Abdul Majeed Waris. After stints at Rennes, Monaco and Nancy, Moukandjo believes he has joined the right club at the right time. "I'm delighted to be here at Lorient and to join an ambitious club," he told BBC Sport. "I have been in this league for sometime now and at 26 this club provides my career with the ideal stability and challenge. "I'm not lowering my standards but taking on a great challenge. I have high standards and I aim to achieve success with Lorient." Lorient only just escaped relegation last season, finishing 16th on 43 points. But Moukandjo says the chance to work with the club president Loïc Fery and manager Sylvain Ripoll was a big influence on his decision to join the Brittany club. "When I spoke to the people in charge I could see the club is heading in the right direction," he added. "I realise they are eager to fix the lessons from a difficult season and there is a solid foundation for this season's realistic ambition and beyond. "It wasn't difficult to make up my mind to come here. I received unbelievable offers from Asia but I prefer to continue my progress in this league and with Lorient. "It's easy to be tempted by big money but I was not going to sacrifice my progress and development for that." Moukandjo made his international debut for four-time African champions Cameroon against Senegal in June 2011. An integral member of the Indomitable Lions, he started all three group matches against Mexico, Croatia and Brazil at the 2014 World Cup. At the 2015 African Cup of Nations, when Cameroon were knocked out at the group stage, he scored in a 1-1 draw with Guinea.